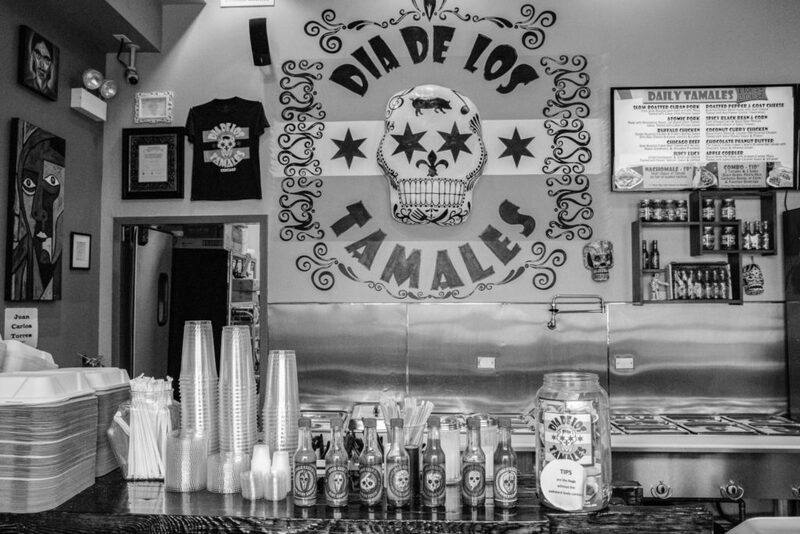 The revolutionary tamales of Dia De Los Tamales, located on 939 W. 18th St. in Pilsen, are the brainchild of Jeni and Sam Wahl and their partner and head-chef Keith Carlson. Born and raised in Miami, Florida, Jeni has been greatly influenced by her Cuban heritage; it informs the culture of food both at the restaurant and the group’s catering business, Get Off The Couch Catering. Could you tell me a little about yourself and the origin of Dia De Los Tamales? I started Dia De Los Tamales and Get Off The Couch Catering events with two other business partners, my husband, Sam, and our partner Keith. We all have different backgrounds in regards to what we bring to the table. I have more of a sales and marketing background. Keith is an executive chief. Sam has a hotel and hospitality background. But we all kind of do a little bit of everything. I used to host a lot of events. Sam and I met in the music business. So Get Off The Couch Catering started by us doing a lot of backstage and catering for touring bands and musicians that we met throughout the years. When we decided to build out our catering kitchen, we wanted a storefront of something that would be fun, a little different—a fun twist on something—and we went through different ideas. I am more of a party host, so people were more familiar with what I cook even though I don’t have a professional culinary background. A lot of the recipes you’ll see here in the shop are my grandmother’s Cuban recipes. So we came up with this concept to have something cultural to kind of lean on, as a base, as a foundation, but also something we could kind of leap from and also create fun twists on that original idea. Where did the Nachomale and the other nontraditional tamale ideas come from? When it comes to the tamales itself, the buffalo chicken was kind of our first venture off the traditional path. We were like: “Well, if you can do red sauce and chicken, and green sauce and chicken, then why not buffalo sauce and chicken?” We played and played with it until we felt we got it right. Once we got that right and felt like we got the true essence of the buffalo chicken flavor coming out in it, that’s when we started jumping to some of the other ideas like Chicago Beef and Juicy Lucy, etc. I think the nachomale was just kind of a progression of that. I mean, most people love nachos. So why not pop a tamale right on top of there? We sell nachomales at festivals like crazy because people at festivals often times just eat once during the day and use that to kind of curb their alcohol consumption. It’s a good filler-upper. Do you offer vegan and vegetarian options? Something that is important to us—even though I’m telling you that we’re pork-centric because we have a big pig in our logo—is also keeping our vegetarian and vegan crowd happy. I find that, especially at festivals and stuff like that, it’s really hard for someone who is vegan to find something other than fries, fried mushrooms, or funnel cake to eat that is actually like food—that isn’t deep-fried and a side dish. A nachomale for example: we can do the chips; we can do the black beans. Our Cuban black beans are vegan. Instead of cheese sauce, we can do the fricassee—our warm tomato and garlic sauce—that we put on tamales. Then we can do a black bean and corn tamale which is vegan, and with red or green salsa on top, and you’ve got a giant meal that isn’t just like a side dish with no color or vegetables in it—something that has multiple layers of flavor to it. I think people appreciate that. Would you call these gourmet tamales? We call them revolutionary tamales because I think artisanal or artisan is kind of five years ago at this point, and it’s a little overused. Gourmet, I like, but I think revolutionary defines it really well. So, that’s my go-to: revolutionary tamales. Do you have a motto or mission statement for the restaurant? Our motto I would say—we’re more people-oriented than anything else. I’m really about just making people happy, and I know Sam and Keith feel the same way. It’s about community. It’s about having great employees—a good team of people. Without good people nothing exists. It’s not the type of food. It’s not what we’re serving. It is how we serve it and the energy and the heart that goes into that. If you could give a message to our readers, what would it be? We’re a little family-owned business and we want to make people happy. It’s all about the experience. Come and enjoy our beautiful patio—we have a fifty-seat patio. And keep your eye out for us this summer! You’ll be seeing us, this summer, in more places than you have in the past. Great piece. I will be visiting this place now as a result of it. Thanks for your information Maria Babich! Great place to eat. Unique tamales. Wonderful article Maria Babich!